Frolicking in the imported snow is one of the best parts of the annual “Winter Wonderland” at the Center. The extremely popular annual holiday event is back and bigger than ever on December 1 beginning at 3 p.m. The Winter Wonderland Festival at the California Center for the Arts, Escondido has quickly become a tradition for North County families celebrating the holidays complete with reindeer, pictures with Santa, warm holiday goodies, real snow, and carols being sung throughout the night! Pictures with Santa: Come get a picture of the whole family with the “Big Guy” himself – Santa! All evening in the Cal Club Courtyard our classic, Olde World Santa will be delighting children of all ages with photos and the chance to get in any last minute gift requests with the man himself before it’s too late! Santa’s Reindeer: Returning this year is an opportunity to meet the fearless flyers themselves! A few of Santa’s reindeer will be taking a break to meet all their fans and “pose” for pictures before they take off for the big day. Performances: As always, the stage in the Lyric Court will be bustling with performances from local community groups, choirs, and even some hula dancers as they tell the story of holidays from around the world. Snow Play: This extremely popular area is back once again. 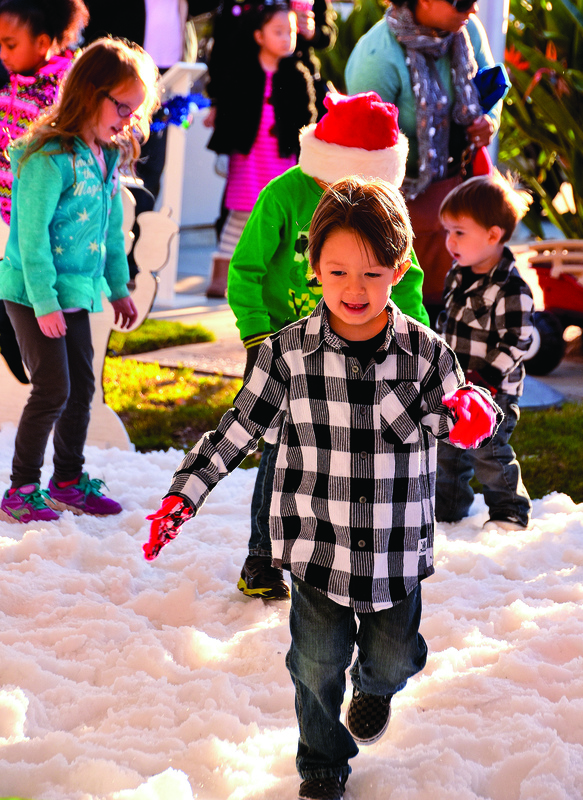 All night long you and your family will be able to play in real snow. Dress warm, and get your snowman making skills ready, it’s gonna get messy! Activities for Kids: Join the California Center for the Arts, Escondido Education team all evening for fun and free arts workshops including origami ornaments, hand-drawn holiday cards, and of course holiday face painting! Princess Meet and Greets: A Winter Wonderland favorite returns featuring princesses from some of the most beloved fairy tales of all time! Don’t miss your chance to light up your children’s night even more with this fun and unique photo opportunity. Train Rides: New this year, climb aboard the Polar Express for a ride around the Center! Enjoy free rides all night long on the new trackless train, especially decorated to get you in the holiday mood! Holiday Light Show: This year the Center will be syncing up your favorite songs of the season as they dance with lights strung throughout the Lyric Courtyard starting at dusk. There are always a few extra surprises in store, so don’t miss your chance to celebrate the holidays at the Center! Join the group in the Concert Hall at 7 p.m. for a Holiday Double Feature viewing of Disney’s Mickey’s Christmas Carol and Dr. Suess’s “How the Grinch Stole Christmas.” Attendees of the Double Feature can mingle with Cindy Lou Who and even the Grinch himself at intermission. At the same time the campus will be filled with local food trucks and vendors featuring a wide variety of delicious food, holiday treats, and a chance to whittle down your holiday shopping list. Sponsors are the Linden Root Dickinson Foundation and George Weir Asphalt Construction Inc.
For more information, including times and location, visit artcenter.org.